Further to my post of 26 March about Andrew Grant's SINGAPORE SLING SHOT and Colin D. Peel's THE RYBINSK DECEPTION - thriller novels by Kiwi writers that were published by smaller overseas publishers in 2009, so got little to no attention here (as they aren't readily available, if at all, on our shores), I have found several other such crime/thriller/mystery titles written by Kiwis that were published last year. Including one I just came across today. It's both troubling, and kind of cool, when this happens. Troubling, because I'm a crime fiction commentator and fan, and even with lots of specific digging over the past few months, I still only accidentally stumbled over these books (so how is a wider crime fiction readership here or overseas meant to find out about them? ), but cool because now it seems there were as many as 15 crime/mystery/thriller novels published by New Zealand citizens or residents, here or overseas, in 2009 - which is way, way more than people realise. We do have a diverse range of current crime/thriller writers, it's just that no one knows much if anything about many of them. So, I have plenty to work with, at least. Much more than people think. Anyway, the 'overlooked' Kiwi crime/thriller release of 2009 that I just came across today sounds like an interesting read. This is the first in a planned series of thrillers starring the Mereliegh Record Club. Rick Foster is a middle-aged guy who enjoys his life and his profession as tour guide and owner of a New Zealand travel company. A craving to bring back the good old days, Foster contacts a group of friends from his heyday in the 60s. Known as the Mereleigh Record Club, these interesting and very active 60-somethings agree to meet and take a tour together. But things go drastically wrong when they become unwilling targets of an international, dangerous drug smuggling gang. A young New Zealand customs agent fast tracked for promotion persuades the group to become part of a sting operation, but things get out of hand when lives are threatened. Friendships within the group are put to the test and Foster’s put in the precarious position of cooperating with the authorities and protecting his friends. Weird relationships between the good guys and bad guys begin to develop and each is left to wonder just who their true friends are. THE MERELEIGH RECORD CLUB TOUR OF NEW ZEALAND was published by a small New York publisher, and is available on Amazon.com, Amazon.co.uk, and Book Depository. The auhtor, Roy Vaughan, is a writer and like his main character, owns his own travel company. Apparently Vaughan is currently working on a series of books based on the Mereleigh Record Club’s travels, so it looks like we may have more thrillers to come, starring the rag-tag bunch of senior citizens. Vaughan lives in New Zealand. I'll bring you further details as they come to hand. Edit: I've just come across a couple of small news stories that suggest the book was launched in New Zealand in early 2010. In a Northern Matters article, Vaughn is noted as having already completed the second Mereleigh book, which he hopes to release at the end of this year, and has started on the third and final book in the trilogy.“A recent visit to Britain and a surprise reunion with some old adolescent era friends prompted me write a novel,” Roy says. “We were all members of a very informal record club at Marlow. 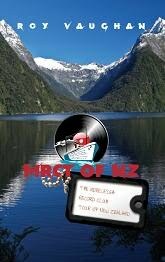 The friends wanted me to organise a tour of New Zealand but the recession killed any chance of it happening so I simply invented a tour and the events in the book.It was a pure labour of love and I hope it will help promote New Zealand as a tourist destination. Primarily I hope the books are a good read." Roy Vaughan worked as a deck officer in the British and New Zealand Merchant Navies, and it was a job with the Union Steam Ship Company that brought him to NZ. He worked as a journalist for the NZ Herald, started an Expo Association and did a stint in Fiji setting up a PR and information section for the South Pacific Forum. So, how does a road-trip thriller starring a bunch of middle-aged/elderly guys sound? Wrap in some drug dealings gone wrong, and plenty of adventures; I'm intrigued. Would such a book interest you? Thoughts and comments welcome.